In the vast world of drone flight, there are countless reasons to reach for the heavens. No matter why you're spending time in the sky, however, it’s always nice to be able to capture the journey. Are you unsure which drones with camera you'll need to create a visual diary of your airborne adventures? Fear not, because we’ve made it simple to choose the right option. Here’s everything you should know about finding an amazing﻿ drone with camera capabilities. Don't have time to read the entire guide? Check out our picks for the best camera drone in each price category! Tips and Tricks for Using Your Newly Purchased Camera Drone! When it comes to picking a drone with a camera, there are thousands of amazing options. Here are just some of the models that you should consider if you’re serious about having a great time and creating awesome footage along the way. 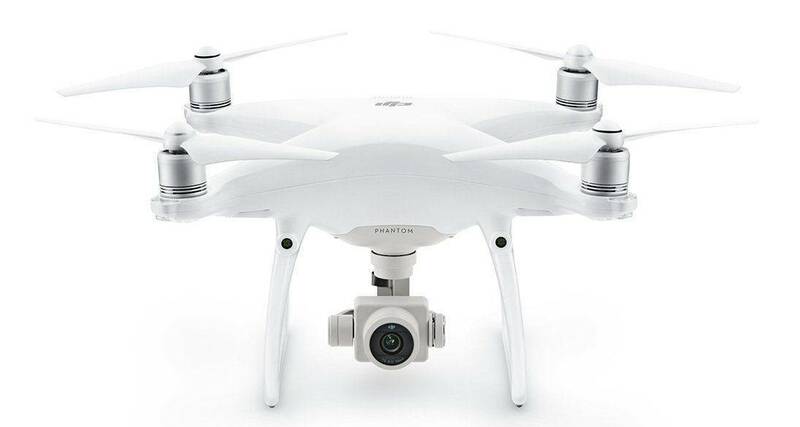 The DJI Phantom 4 is one of the most prolific models of drone on the market. It is largely responsible for starting the drone craze and was the first affordable drone to have an included high-resolution camera mounted on a gimbal. This meant it was the first time that novice pilots could get smooth high-resolution shots from the air. Since its initial release, DJI has come out with many variations of the Phantom 4 including the Phantom 4 Pro Obsidian. The Phantom 4 is not the most portable of drones, coming in at 1388 grams, or about 3 pounds when loaded with propellers and a battery. 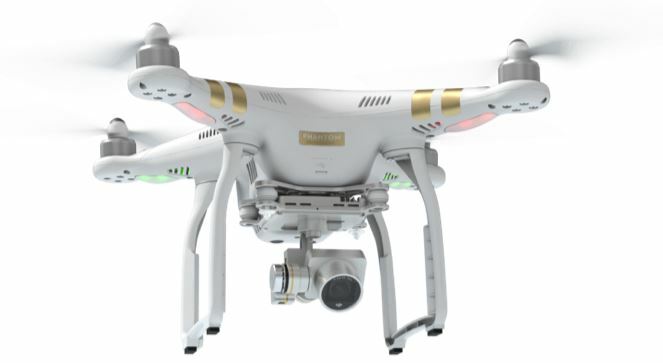 At its largest diagonal dimension the Phantom 4 measures 350 mm across, or about 13.7 inches. The propellers and arms of the Drone don't fold, meaning the Phantom can take up quite a bit of space in a vehicle, but the obsidian version comes with a convenient and purpose-built backpack for the drone making transportation little more reasonable. The camera on the Phantom 4 Pro is one of its most notable features with a 6-way gimbal offering outstanding stabilization even while moving at full speed. The CMOS sensor can capture still images up to 20 megapixels in size and can also record video in a number of different resolutions and frame rates. 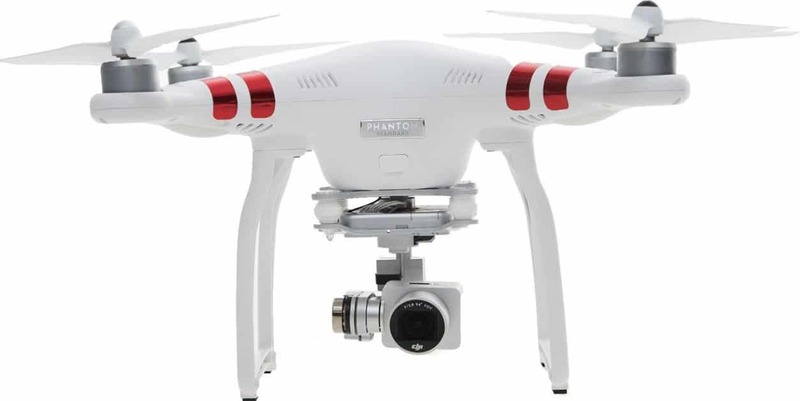 The video for the Phantom 4 caps out at 4K resolution and 60 frames per second with a 100 megabyte per second bitrate making it outstanding for content creators or professional drone videographers. The Phantom 4's camera can also run at lower resolutions for those who might not have a computer capable of editing 4K video. The camera can record at 1080p using 120 frames per second for those looking for extra smooth shots or intending to slow down the shots in editing. Given its size, the Phantom 4 is also surprisingly agile able to fly at 45 miles an hour, or 72 kph. The Drone also features a 30-minute battery life and the obsidian version comes with multiple batteries. The Phantom 4 also boasts a variety of autonomous features such as infrared collision avoidance and automatic hovering which is great for novice pilots trying to get smooth shots or clear images. DJI largely pioneered the inclusion of autonomous flight and pilot assistance in its drones and its one of the features that have earned it such a large share of the high-end drone market. Check Out Amazon's Great Price on the Phantom 4 Pro Obsidian! The DJI drone company didn't feel that dominating the high-end drone market with the Phantom 4 alone was enough, so they decided to one-up themselves and become their own biggest competition with the release of the highly advanced DJI Mavic Pro. The Mavic pro features many of the same capabilities as the Phantom 4 but boasts a more compact form factor and improved cosmetics along with other improvements to both the performance envelope of the drone as well as some of the autonomous features. The Mavic pro has a comparable top speed to the Phantom 4 at 40 miles an hour or about 65 kph. The battery life also stacks up comparably coming in at 30 minutes on a still and windless day. While the Mavic Pro lacks some of the connectivity options of the Phantom 4 it retains the greater than 4-mile range capability. The controller for the Mavic has half as many frequency options as the Phantom 4, but unless you're flying in an area with many other drone pilots at the same time this shouldn't be an issue. The controller for the Mavic is slightly more compact and can be folded into an even more portable form factor. The controls themselves are also greatly simplified and the drone features a wide variety of automated flight capabilities. The controller can also hold a phone for a real-time feed of the onboard camera's point of view. The camera on the Mavic features a 3-axis gimbal that gives the speedy drone smooth and stable looking shots even while in motion or changing directions. The camera uses a CMOS sensor which can capture 12.3 megapixel still images or record 4K video at up to 30 frames per second. For still photography, there is the option for a single shot or burst shooting 3, 5, or 7 frames at a time. There are also a number of other options such as auto exposure bracketing and interval snapshots which work excellently when paired with the drones autonomous flight features. The drone can also record in other resolutions at a variety of frame rates including 1080p at 30, 60, or even 96 frames per second. while this isn't quite as high as the frame rate capabilities of the Phantom 4 it's still capable of being slowed down in editing and remaining clear and smooth without the stuttering effect that usually accompanies slowed down video. In addition to its 40 miles an hour top speed the Mavic boasts an ascension speed of over 16 feet per second and has a maximum altitude of 16400 ft. On a single charge, its 30-minute battery life can give it a max travel distance of 9.3 miles. The autonomous features of the Mavic pro Platinum include automatic takeoff and landing, collision avoidance using its onboard infrared sensors, as well as being capable of essentially piloting itself in follow or orbiting modes where it tracks a target to follow or move around in circles. This makes it great for even first-time pilots to fly and ensures your investment in a top of the line drone won't go to waste if your piloting skills aren't yet the best. 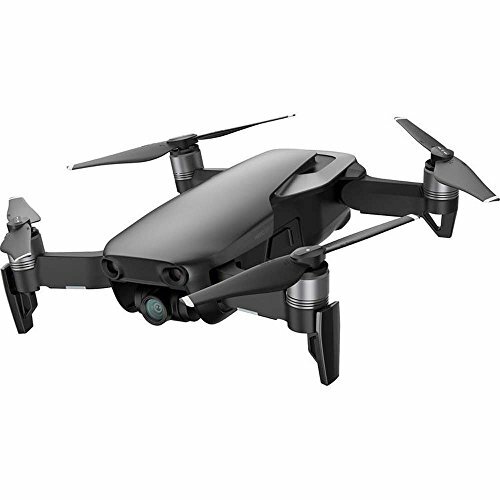 The incredible thing about the Mavic Pro Platinum is that is capable of such impressive flight and recording all while being only 1.6 pounds, or about 734 grams, including a battery. At its largest, the diagonal size of the drone is 335 mm, but when the arms and propellers are folded in the drone measures only 83 mm in width and 198 mm in length, or about 7.8 inches long. 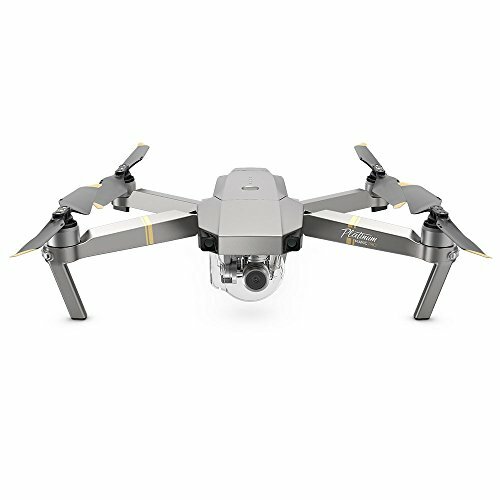 For portability, extreme performance, and high-resolution recording, almost nothing can rival the Mavic Pro Platinum. The fly more combo includes a variety of accessories that accommodate just about anything you could need. The kit includes extra batteries, a carrying case for the drone and equipment, chargers, a controller, large SD cards for storing video, and a variety of other accessories. The extra battery will help this drone with wifi camera stay in the air longer. 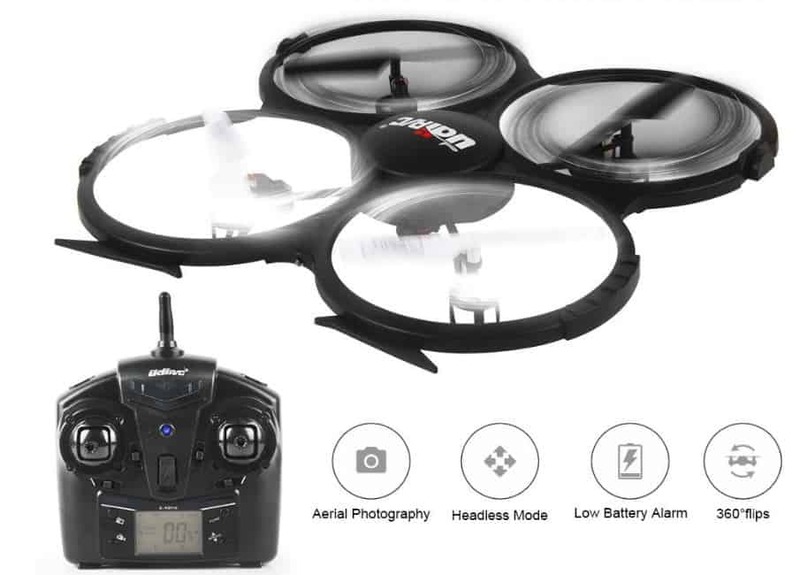 This pro drone proves its not hard to get a drone RTF for a great price. After seeing the overwhelmingly positive response to its diminutive Mavic Pro Platinum DJI decided there was a market for going even smaller. If you're looking for the most compact drone that can still record at 4k and is a blast to fly, then the Mavic Air is a great choice. 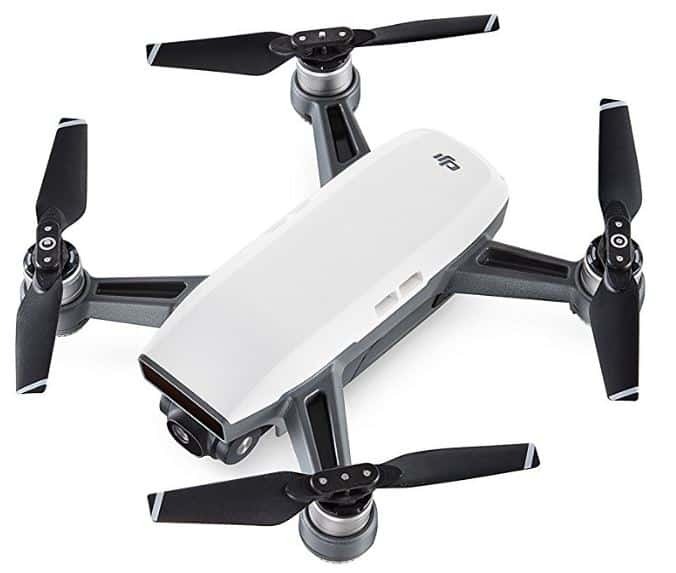 The DJI air comes in at only 430 grams, or less than a pound, and with arms unfolded and its propellers out it is about 184 mm wide, or about 7.2 inches. Like the Mavic pro, however, this drone can fold its arms in compacting it down to only 83 mm in length, or 3.2 inches. This incredibly compact form factor, however, does not have an impact on its flight performance. The Air is still capable of a top speed of over 68 km per hour, or over 42 miles per hour. The Drone also boasts a maximum altitude of 5000 m or 16,000 feet. The decrease in size does come with some drawbacks though, including a decrease in the battery life of the drone coming in at only 21 minutes of flight time. The maximum range is also slightly decreased but it's still an impressive two and a half miles allowing for full use of the drone's camera and autonomous features for capturing stunning imagery of places difficult or impossible to reach and record otherwise. The camera on the Air sticks to DJI's trend of having high-quality cameras with excellently stabilized gimbals. 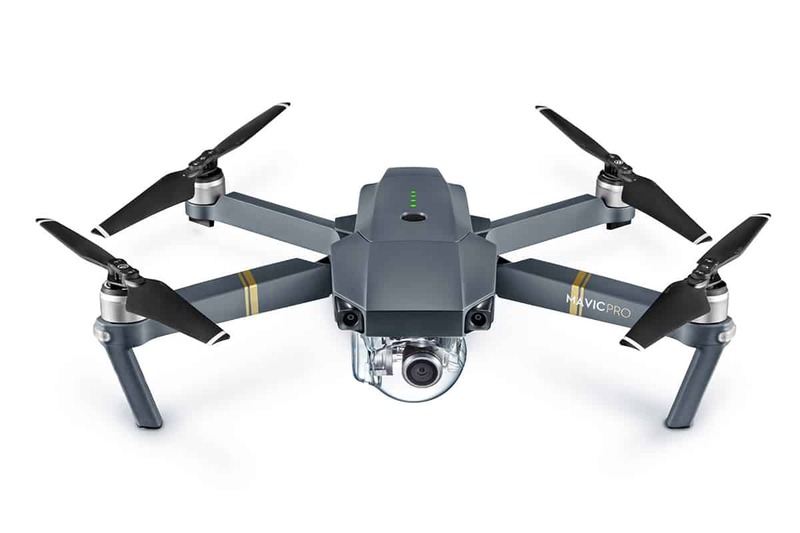 The Mavic Air has a similar three-axis gimbal to many of the other drones in the DJI lineup that allows the drone to take smooth shots even when moving and changing directions. The built-in camera can record in 4k add up to 30 frames per second, 2.7 k at 60 frames per second, or 1080p at an impressive 120 frames per second. These higher frame rates allow for shots to be slowed down considerably in editing while remaining smooth and avoiding the stuttering effect that slowing down footage normally causes. The video bitrate at 4K is 100 megabits per second meaning colors will pop and even zooming past trees at the drones top speed of over 40 miles an hour will come through as smooth. The drone can also take still images up to 12 megapixels in size. Like the other drones in DJI's lineup, the Mavic air features highly advanced flight autonomy that utilizes forward, backward, and downward sensors to detect the environment around it allowing it to hover and avoid collisions all on its own even when the operator on the ground might be instructing the drone to head into an obstacle. The DJI Air is also capable of active tracking, allowing it to lock onto and follow a target without the need for pilot input. Autel Robotics is quickly becoming one of DJI's biggest competitors and their flagship drone the Evo is fairly comparable to the Mavic Pro. 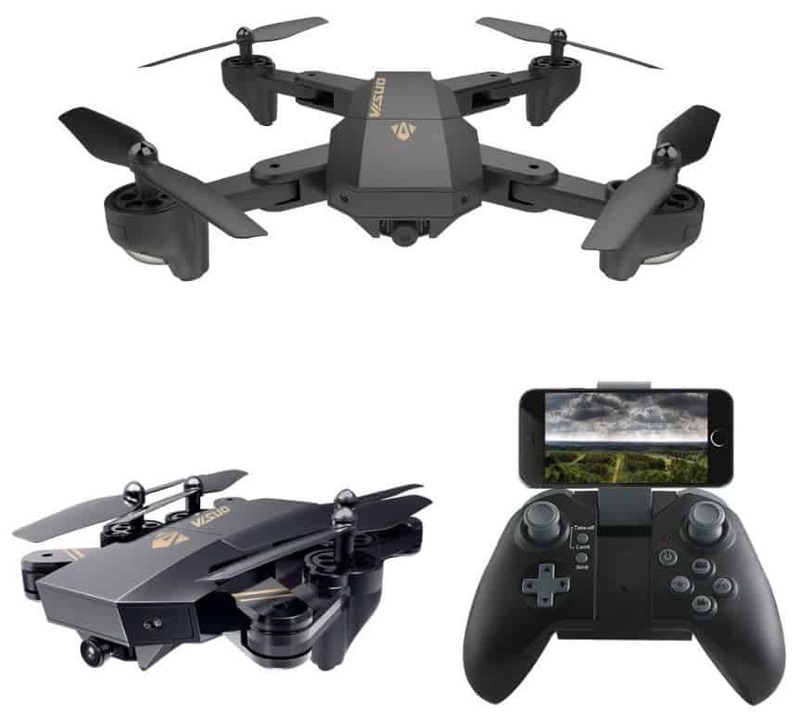 It is a top-of-the-line folding portable drone with a very high resolution 4k camera and a wide variety of autonomous flight features. For those looking for a drone to use for professional content creation or those who often travel and want a drone with a 4k camera that is still very portable the Autel Evo is a great option. The Autel Evo comes in at 863 grams, which is about 1.9 pounds, making it relatively light for its size coming in at 338 mm across when completely unfolded. The Autel Evo boasts a top speed higher than both the Phantom 4 or the Mavic Pro at 44.7 miles per hour or about 20 meters per second thanks to its relatively large propellers. It accomplishes this while still being very portable though, as the arms and propellers both fold to save space and make the drone easy to transport. The Evo uses the same frequencies as many of the DJI drones meaning it matches its competitor's 4.3-mile maximum range. It also features comparable batteries giving it a 30-minute flight time. The Evo is surprisingly durable given its agility and lightness able to handle temperatures between -4 degrees Fahrenheit and 140 degrees. The batteries on the drone can be quickly swapped out for those who need extended flight time and the battery in the controller can last 3 hours or more. The controller also features a bright OLED screen that allows the pilot to see their drone's perspective in real time. For the most part, the camera on the EVO is comparable to that of the Phantom 4. It can shoot in 4K resolution at 60 frames per second, or 1080p at 120 frames per second. Where the Evo's camera truly shines is with extremely high frame rate recording as it can record at 720P resolution at 240 frames per second. This means you can slow down the footage by a factor of 8 and still have a cinematic 30 frames per second with your finished product. 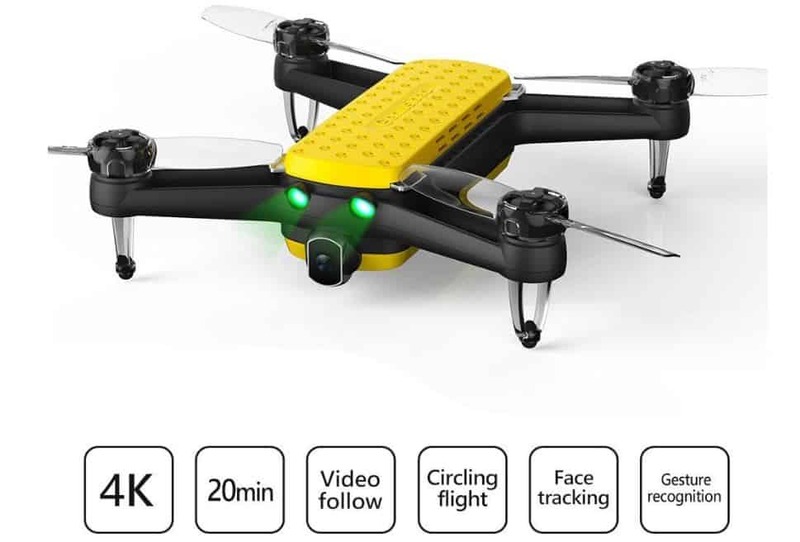 This helps out greatly you when traveling at the drone's top speed of over 40 miles an hour at low altitudes where the ground can quickly become a blur at lower frame rates. The Evo utilizes an advanced array of onboard sensors that include a GPS/GLONASS receiver as well as ultrasonic vision systems that are fed to the drone's onboard computer giving it excellent obstacle avoidance capabilities. When instructed by the pilot on the ground to fly forward the Evo is intelligent enough to not only stop before reaching an obstacle but you correct the path so it simply flies around it. This can be invaluable for novice pilots, flying indoors, or while flying outside of your line of sight as sometimes the onboard camera doesn’t capture things that are just out of view. The 3DR Solo quadcopter is the first drone in our roundup that lacks an onboard built-in camera of its own and instead opts for allowing the user to mount a GoPro on to its gimbal. 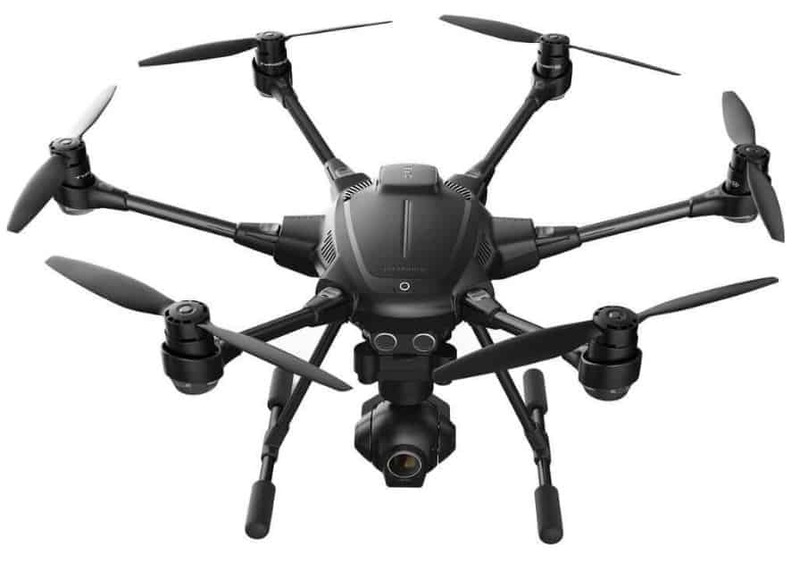 The 3dr solo also features dual onboard computers that process data from a variety of sensors on the drone allowing it to precisely and accurately offer new pilots an easy to fly experience. The 3DR Solo quadcopter is arguably one of the most agile drones on our list with a top speed of 55 miles an hour, or about 89 km an hour, making it popular for drone racing. It also has a maximum vertical ascension speed of 10 meters per second allowing you to reach its maximum altitude in only 12 seconds. The maximum altitude for the 3DR Solo is limited to 400 feet, or about 122 meters, out of the box due to FAA regulations, however, it can be adjusted by the user later if you get special clearance or permission from the FAA to fly at higher altitudes or you know that your local drone laws permit it. The controller on the 3DR Solo has a maximum range of half a mile and can be paired with third-party amplifiers to increase the range in the future. The drone has a flight time of 25 minutes on its own or around 20 minutes with a GoPro or other payload attached. The 3DR Solo uses a secure Wi-Fi link to pair with a phone and the controller allowing the pilot to see a real-time video feed in 720p quality while flying the drone. In total, the drone weighs about three and a half pounds, or 1.5 kilograms, and is 18 inches across, or about 46 cm. The gimbal for the solo is not included but holds a GoPro Hero 3 plus or Hero 4 and features 3-axis gyro stabilization and can be controlled from 0 degrees to 90 degrees in pitch. in order to get shots of something that might be slightly above or below the drone. Thanks to its dual onboard computers the 3dr solo has some outstanding autonomous flight features. The drone, like many others on the market today, is able to lock onto a target and follow it from a distance making hands-free piloting while driving or hiking a possibility. There is also an orbit setting where the drone circles a given target such as a building or other point of interest. A cable cam option is also available where the drone flies on a predetermined pattern from point A to point B making it easy to take smooth videos or excellent still shots. Finally, there is a selfie mode that allows the drone to be used much like a tripod for taking still images or videos of yourself and friends. Since the drone does not come with its own camera built-in the resolution and recording capabilities of the drone will be determined by which GoPro you attached to it. The Hero4 Black, for example, can record in 4k at 30 frames per second, 1080 at 120 frames per second, or 720p an impressive 240 frames per second allowing for slowed down playback. The Hero4 is also capable of still images up to 12 megapixels and can take these images at a rate of up to 30 per second. Get a good gopro camera and an extra lipo battery and you will be all set to fly this baby. 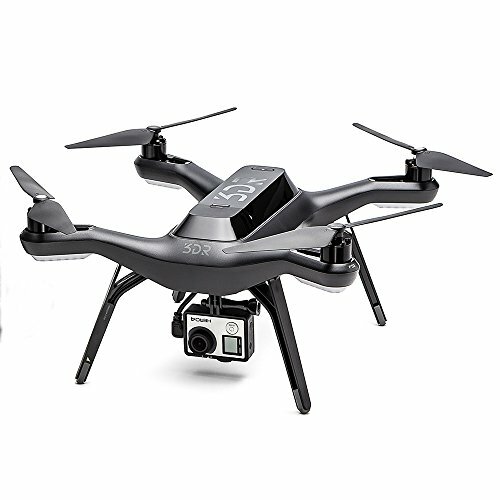 Check Out Amazon's Great Price on the 3DR Solo! What do these features mean for the UDI U818A’s camera capabilities? For one thing, the design’s maneuverability lets you create pretty neat footage by performing maneuvers like barrel rolls and loops. Also, the controller includes a push-button image capture function, so it's not hard to start recording or taking photos. Although this drone makes it easy to get skyborne, it’s not exactly the ideal option for those who dream of creating cinematic masterpieces. Its video hardware only produces HD output, and at just 1 megapixel, it’s considerably less than movie quality. Still, this drone has a reputation for being somewhat crash-proof, which might suit those who want to experiment by adding more expensive camera hardware. The udi 818a is a great little rc quadcopter drone. Check Out Amazon's Great Price on the UDI U818A! If anything stands in the way of the Rabing’s ability to generate great footage, it’s the fact that it only works for about eight minutes at a time. In other words, you’re going to have to plan your shots and capture them in the first few tries. With a maximum working distance of just 100 m, this miniature drone certainly isn’t for everyone, but it’s still pretty great for casual use. If you’re looking for an easy first drone with camera experience, then the Rabing RC Foldable Flight Path isn’t bad. Check Out Amazon's Great Price on the Rabing Drone! Don’t let the fact that this one comes from an RC manufacturer fool you. The Holy Stone HS300 is well-known among the drone-flying community for its high quality and focus on improved content creation. For instance, it includes a pro-grade 1080p HD camera equipped with a 120º wide-angle lens, which gives you the power to create unique, epic shots. This drone incorporates a shock-resistant camera and an automatic hover function that kicks in when you ease off of the throttle. In other words, you can shift focus from flying to capturing footage at any moment. Perks like included SD memory cards, extra USB cables and replacement propeller blades make this an awesome model for those who haven’t quite established their aerial video studios yet. Check Out Amazon's Great Price on the Holy Stone HS300! Of course, using an aerodynamic racing-style drone to capture video is nothing new. This model, however, features a sharp 1080p camera and the ability to connect to GPS or GLONASS satellites for lower-latency positioning that lets it maintain high speeds. Potential disadvantages include the fact that you’ll require a 5 Gigahertz-capable WiFi mobile device, like a phone or tablet, to control the drone. The lightweight construction may also be a bit less crash-resistant than you like. This is a fun drone with hd camera to fly, as you could almost consider it a racing drone. Check Out Amazon's Great Price on the bugs 2! The Spark also has a nice camera, so it's a good starter drone for those who like great image quality. This device can learn to follow your hands and respond when you make the right gestures. With such a minimal learning curve, you can begin expressing yourself in seconds. While the Spark's gesture-controlled mode isn't capable of capturing video, it can handle still photos just fine. What's more, DJI has a good reputation for releasing upgrades and enhancements. As a solid flying camera platform from an established manufacturer, this is a great option for those who are more excited about videography and taking selfies than drone flight for its own sake. We are actively waiting on the DJI Spark 2 release date, which may bump the original from our list. This is one of the best selfie drones for the money. This hd camera drone can also take sphere panoramas. Check Out Amazon's Great Price on the Spark! This drone looks less impressive than other more aerodynamic models, but if you're in the market for a sturdy flying camera platform, then it's not a bad choice. With the ability to shoot in 4K HD and about 20 minutes of flight time, there are few limits to the kinds of fun you can have while you're creating new things. The led lights make this drone a little easier to fly at night. Cool features that might make it easier to shoot to your heart's content include Target Following that keeps up with you while you're in action and Fixed-point Surrounding that tracks your subjects from different angles for more dramatic shots. The camera, a Sony IMX214, is adjustable to a range of angles between 0º and 90º, so it shouldn't be hard to innovate new ways to create compelling imagery. This drone has many awesome perks, but its makers designed it for beginners. Thanks to a simple control scheme and a high-capacity battery, you get to experiment with many different production styles. This is one of the cooler looking toy drones with greater than 1080p video. Check Out Amazon's Great Price on the Geniusidea! Another classic drone from DJI, the Phantom 3 Standard is legendary among YouTube creators and other amateur videographers. Part of its widespread success may have to do with the fact that you can view images live as you record them from half a mile away. While you can't output 4K video, the 2.7K format that this drone produces is still pretty good, and the camera's 12-megapixel still-frames aren't too shabby either. As we covered in one of our previous reviews, members of the Phantom 3 family are among some of the longest-flying consumer models on the market. For example, this version's 25-minute flight times are great for making videos. The drone's programmable functionality also comes in handy because you can tell it to follow a given path and make your shots look smoother without editing. If you're a professional with work to do, then this is a nice tool to lighten the load. Check Out Amazon's Great Price on the Phantom 3 Standard! 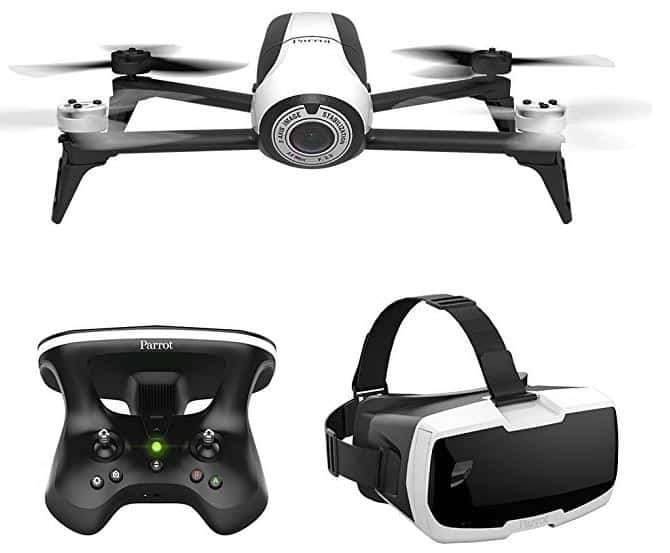 With a wide-angle camera that shoots 1080p videos and an FPV hd headset, this drone suits those who'd like to try different production styles. Since the BeBop2 also comes paired with an FPV headset and intuitive controller, you can dive right into an immersive piloting experience, which might make it easier to create the kind of content that really gets your viewers interested. Unlike certain drones, this device takes a few cues from digital cameras. For instance, it captures images in multiple formats, such as RAW, DNG and JPEG, so you gain the freedom to choose how you work. Although some reviewers said that they had trouble with extremely tight spaces, others felt that this design was equally maneuverable indoors or outside. Whether you're just hovering around nearby or taking videos of something a mile away, you get to explore with ease, and so do your viewers. Thanks to the BeBop's Flight Plan app, you can even capture complex journeys complete with programmed waypoints. This fpv quadcopter with 1080 hd is pretty awesome to fly. Check Out Amazon's Great Price on the Parrot Bebop 2! When it comes to professional video creation, the Phantom 3 Pro is more than just a well-known name. This quadcopter works with iOS and Android for convenient live viewing and numerous camera control options. Since you get to connect your phone or tablet to the controller, it's easy to customize your production workflow and keep your equipment budget manageable without sacrificing HD previews. 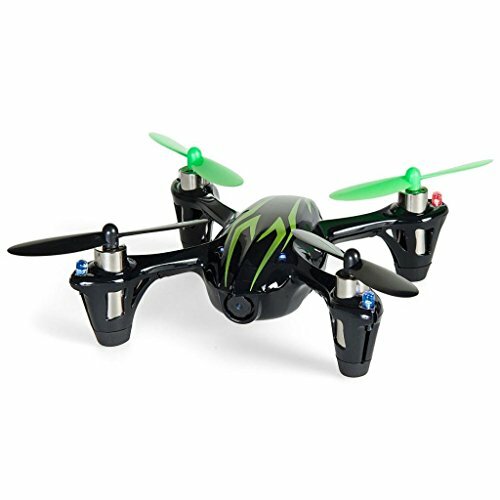 If you're eager to lift off as quickly as possible, this drone has a Beginner Mode for training purposes. Features like Vision Positioning let you fly safely at low altitudes, avoid objects and stay aloft even without GPS, so it's easy to shoot at a distance of up to 5 km. These perks turn out to be quite useful since the 4K UHD camera captures your performance in such high detail. In its day this was one of the great professional models for high quality video recording. Check Out Amazon's Great Price on the Phantom 3 Pro! Don't be scared off by the fact that this drone targets professional users who appreciate the technical aspects of flying. 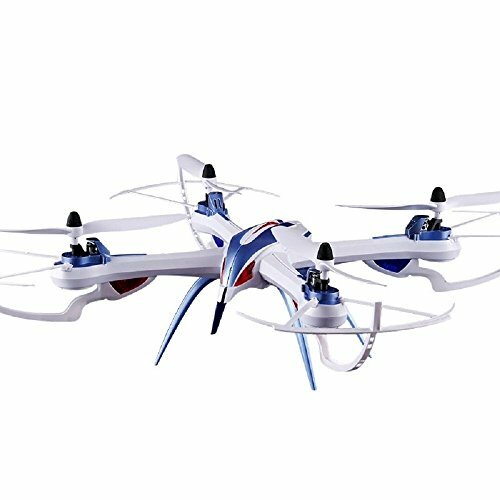 The Autel Robotics X-Star quadcopter tries to make your life as easy as possible by including a display with a straightforward LCD screen, a solid hard case, and everything you need to take off successfully. Regarding its video capabilities, this aircraft is nothing if not versatile. For instance, you can record in 4K UHD, 4K HD, 2.7K, 1080p and even 720p format. The camera also attaches to the drone via a quick-release, triple-axis gimbal, so you can swap out your optical hardware and still take steady shots. The X-Star is convenient for walking around and exploring new scenery as you capture your surroundings. Because it lets you stream a 720p preview from a mile away, you don't have to worry about missing little details that might be worth further investigation. Autel also offers customer support every day of the week, so problems should theoretically be easy to solve. Check Out Amazon's Great Price on the X-Star! This drone is good for prosumers, but its unique design may not fit the bill for everyone. For instance, it comes with a 4K camera that rotates through a 360º path, and you can operate the camera independently. The only problem with this is that some reviewers said the camera mount isn't quite as robust as you'd expect from a pro-grade drone. Of course, there are definite positive perks. For instance, you can fly in either of two control modes that let you pick your preferred style, and the retractable landing gear is a true rarity. On the other hand, if you're not an enthusiast, then you may find yourself more attracted to something a bit less finicky. Check Out Amazon's Great Price Typhoon H! The Mavic Pro is a decent option for those who don't mind going for full features yet would rather not lug around larger platforms. In addition to shooting in 4K, the drone is one of the few to offer portrait and landscape image configurations without making you try to fly at impossible angles. We believe we will see the DJI Mavic 2 Pro released soon, which could bump this off our list. Check Out Amazon's Great Price on the Mavic Pro! While 20-megapixel RAW and JPEG images are pretty sweet, this drone's price may not be worth the upgrade unless you're a professional. For instance, the cameras are a step up from the regular Phantom 4, but the drone doesn't work unless you supply a compatible smart device, and some claim that its side sensors could be more capable. We are looking forward to see what the Phantom 5 will bring us. Check Out Amazon's Great Price on the Phantom 4 Pro! Of course, if becoming a serious drone videographer is your goal, then you should welcome the ability to customize such a professional platform. For instance, the CinemaDNG-compatible output is what movie studios use for digital content, and the Apple ProRes activation key that comes with the Premium model is a necessity for encoding your creations. While having a range of around 4.6 miles and 15-inch propellers is perfect for lifting heavier professional cameras, this drone may be out of reach unless you're running a company. This is definitely one of the pricier drones on the market today. 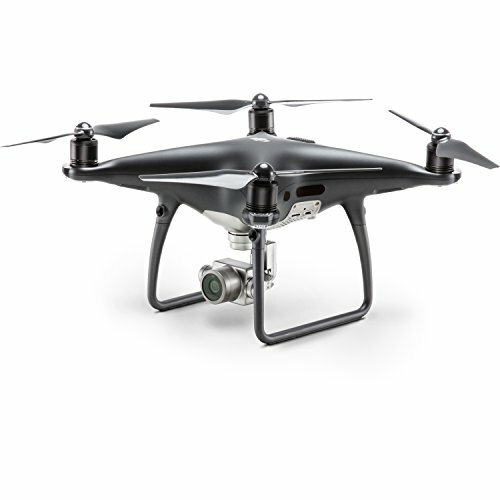 Check Out Amazon's Great Price on the Inspire 2! The Tarantula X6 is a sleek-looking and affordable drone that is capable of carrying a wide variety of gimbals and cameras. The basic model comes optionally with its own 5-megapixel camera, but this can be easily upgraded with a variety of other options. The drone is arguably the most affordable model that can carry things like a Mobius or GoPro camera and is the most modular option on our list, making it great for those who like to have tons of options in regard to cameras and gimbals. The drone is reasonably easy to control thanks to its 6-axis gyroscope that allows the drone's onboard computer to always know how it is oriented. The 6-axis gyro also makes it very stable in the air enabling smoother shots and clear still images. 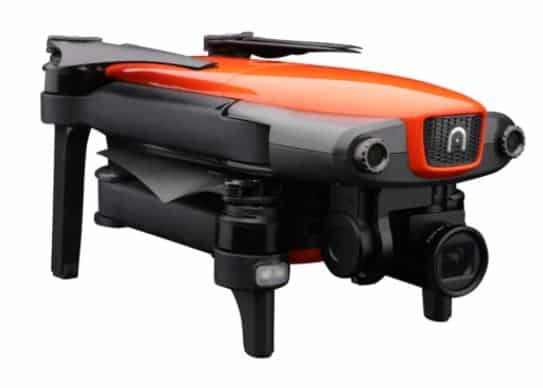 The drone also features what is referred to as hyper IOC, or intelligent orientation control. This orientation control feature allows the pilot to aim the drone more effectively at whatever you were trying to shoot or film. 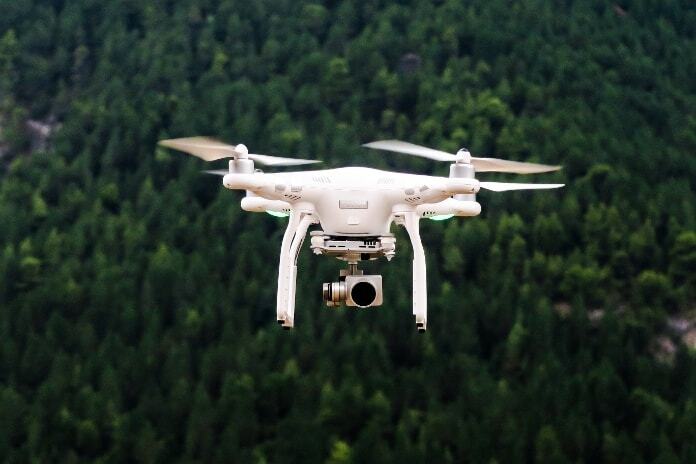 Pointing a drone in a direction from far away can be surprisingly difficult since the drones quickly become small and hard to see in the air as they fly further and further away and exactly which way the camera is facing can become unclear. The information regarding orientation from the hyper IOC is shown on the LCD display at the bottom of the controller which also shows a variety of other information such as battery life. The drones battery features a 10 minute flight time and can be easily recharged while the controller requires 6 AA batteries. The hyper IOC can also lock the drone into a certain orientation so the pilot can always keep track of which direction the camera is facing no matter where the drone is flown. The drone lacks a gimbal out of the box, however, it features a variety of mounting points on the bottom of its body that allow for a variety of mounts and cameras. Most people find luck with the Walkera G-2D gimbal which can hold either a GoPro Hero 3 or 4 or another popular drone camera Xiaomi Yi. As mentioned, the GoPro is an excellent option cable of easily recording in 4k at good frame rates and all the way down 720P at a stellar 240 frames per second. While the controller for the Tarantula X6 does not have any way to show the live feed from the camera, GoPro has equipped the Hero 4 with both Bluetooth and Wi-Fi capabilities allowing the pilot to sync the camera with their phone in order to get a real-time view from the drone. The Yi action camera is a slightly lighter camera that is capable of 1080p resolution at up to 60 frames per second or 720p at 120 frames per second. The Yi outclasses the hero for slightly in still images however capable of taking up to 16-megapixel images with its CMOS sensor. The 720p hd camera is a nice feature for a drone in this price range. Who said your buying options were limited to a pro drone. Check Out Amazon's Great Price on the Tarantula! The Yuneec Breeze is an extremely small drone like the DJI Spark. Its designers intended for it to be a portable camera drone that can be easily operated by a single person for recording clear videos and taking still images. The Breeze has a battery life of 12 minutes with a battery that can be easily swapped out while in the field for extended flight time. The drone's top speed caps out at just over 11 miles an hour and features no gimbal but rather has a camera mounted firmly into the frame. The drone is geared towards newer pilots and comes with no controller but rather is designed to be controlled by an app on the user's phone. The onboard camera can take excellent 13 megapixel still images or record at 4K resolution at 30 frames per second putting it slightly ahead of the DJI spark in the videography and photography categories. This drone's camera also features a wider field of view than the spark of 117 degrees as opposed to the 81 degrees that the Spark's camera has. The Yuneec Breeze is a much more manageable drone for most pilots making it easier to fly indoors then the faster and more difficult to manage DJI drones. As with most of the other drones on this list the controller phone app can give a real-time first-person view from the drone's perspective. This can be used along with Yuneec's VR headset to get an immersive first-person View as if you were in the cockpit of the Drone. The first-person view goggles are sold separately and you can also buy a purpose-built controller separately as well. The breeze also features many of the autonomous features you might be used to such as a selfie mode, orbit mode, follow mode, and what unique calls journey mode which sends the drone on a pre-planned course much like a cable cam. Check Out Amazon's Great Price on the Yuneec Breeze! For those looking for one of the most compact or most affordable drones with a camera, the Hubsan X4 H107C is a great choice to look into. The diminutive drone fits in the palm of your hand and features a simple camera mounted directly to the frame with no gimbal. The lightweight and small size of this drone makes it extremely agile, but some simple built-in autonomy features make it easy for novices to pick up. The Hubsan X4 H107C makes a great first drone for those trying to get into drone photography or videography and is exceedingly agile. The built-in camera record at 720P and can take two-megapixel still images. There is an included controller that boasts a very simple design with two some sticks and a handful of buttons for adjusting the trim on the Drone. Trim adjustment accounts for things such as wind and allows the user to make sure the Drone will remain still even if there is a current of air around the drone. This is important for getting smooth shots and clear images while flying the drone outdoors as unnecessary movement can make shots blurry. Since the built-in camera has no gimbal this is even more important. The Hubsan uses a small rechargeable drone battery the offer is an 8-minute flight time and can charge in 30 to 40 minutes. Replacement batteries are available for those who want to be able to swap out the battery for continued flight. The Drone has a surprisingly stretchy construction for its size coming in at 650 grams, or about 1.4 pounds, and measuring about 7 in across. The Drone can be charged with the battery in place using a USB cable, however, this method of charging can take slightly longer than 40 minutes. The drone has a six-axis gyro built-in that assist the pilot in keeping the Drone stable in flight and features low-power protect which automatically Returns the Drone to the pilot when the battery is about to die. it is still fun to watch drones fly across the room, such as this model. Check Out Amazon's Great Price on the X4 H107C! The last drone around up is the parrot AR 2.0 which is a lightweight and durable quadcopter drone made from a durable foam and plastic construction. 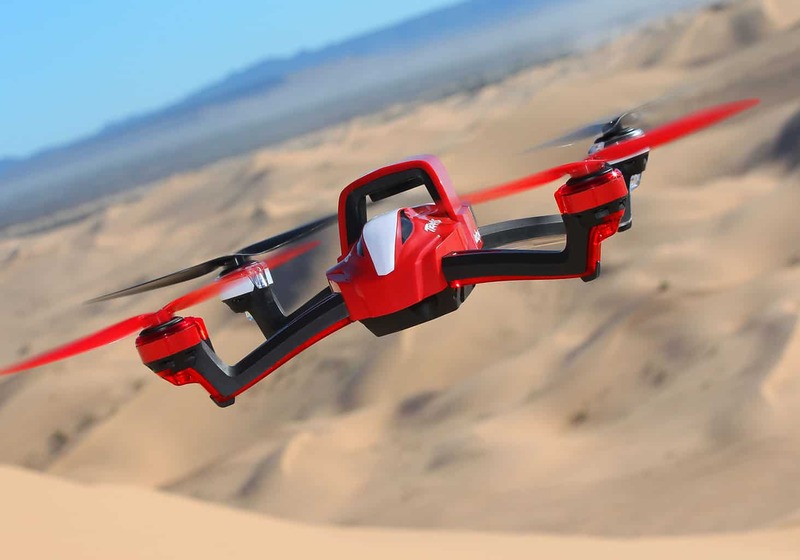 The Parrot AR is a relatively large drone with no portability oriented features built-in. Rather, it is oriented towards ease-of-use for novice pilots. 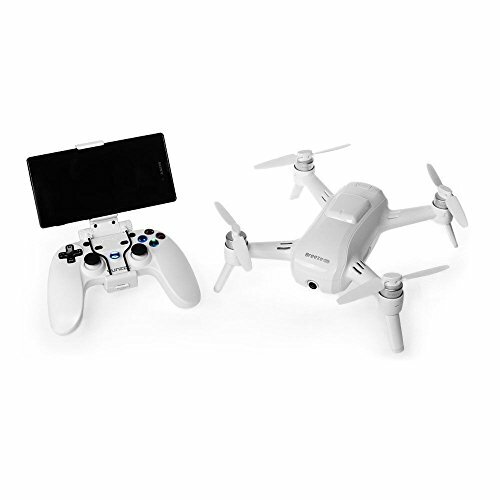 Rather than coming with a controller, the Drone is synced to the user's phone where at relays back its HD video feed and received control inputs. The drone can record in 720p hd video at 30 frames per second making it the lowest quality camera in our Roundup. The camera is also built into the frame without a gimbal giving it no stabilization making the footage choppy sometimes. The Drone features a 12-minute battery life and a 50-meter range, making it less than ideal for those trying to get shots of things that might be far off in the distance or impossible to reach on foot. This drone is more ideal for flying indoors, however, thanks to its relatively low speed and manageable control scheme. The drone is also designed to connect easily with social media, making it a great choice for those who simply plan to upload their recordings to Facebook or other social media platforms. Check Out Amazon's Great Price Parrot AR 2.0! Which drones with camera features should you choose if you’re all about creating exciting footage that puts your viewers right in the middle of the action? Camera hardware isn't the only important element. A drone with a great camera but poor maneuverability will dramatically limit your ability to capture those breathtaking scenes that you want to share with audiences. The heftier your optical gear and lenses are, however, the more likely it is that you’ll have to upgrade to a model with enhanced payload-lifting power. Picking the right camera drone for you can be a daunting task. There are endless options, variations, and modifications to consider, as well as features, camera qualities, and sizes. The most important thing to consider is what you need the drone for in the first place. Are you recording bird migrations from up in the sky? Taking wedding video from above? Capturing still photography from new and exciting vantage points? Whatever it is you are planning on doing with your new drone, you will need a particular type of drone - and a particular type of camera - to get the job done. So be sure you have things organized before you begin, because without understanding what you truly need, you might never be able to narrow down all the options out there. Feeling overwhelmed? Don’t you worry. I am here to help you zero in on what you need, take a look at some options, and hopefully narrow down your search to find your perfect camera drone! 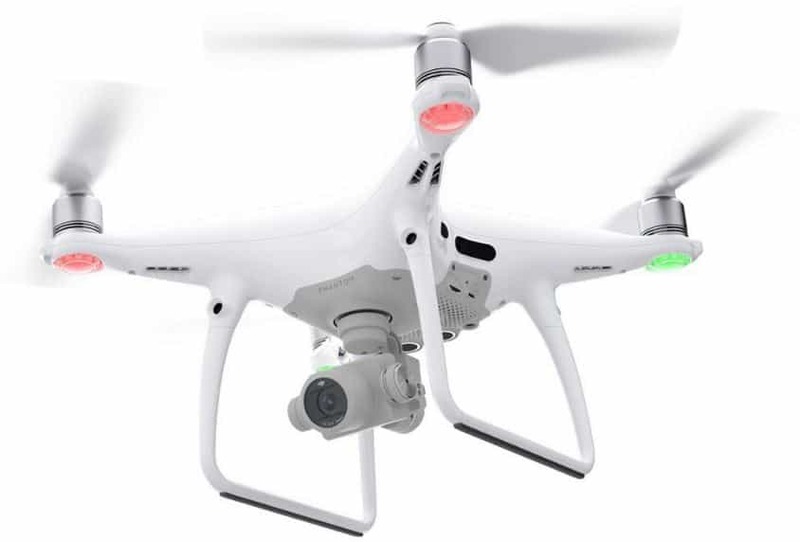 This buying guide will help you find the top rated camera quadcopter. If we really plan to break this down, it’s important that we start here. Do you want a camera drone which comes ready to take out and fly on day one, or are you more the “do it yourself” type? Unknown to some, there are many options for building your own drone out there. Some are inexpensive and more of a hobby project, where others are fully functioning and ready to compete against other ready made drones. If you decide you want to build your own drone, simply search for “drone kits,” “UAV kit” (which stands for Unmanned Aerial Vehicle), or any variation of this phrase. You will be blown away by what you find! I sure was. Who knew just how many kits were for sale for building a drone of your very own?! Next up, we’ll check out which basic features are most important to you in your search for the ideal camera drone. Things like size, material, and flying power are crucial to your ability to utilize your drone for the particular use you are buying it for. Looking at these features first is important, because until you know the basics you will need, you won’t know where to start in your search for the perfect camera drone. -Storage: Have you thought about where you will be keeping your drone when it is not being used? If not, you should start considering this important piece of the puzzle right away. If you only have a small amount of storage space, you will either need to deconstruct your drone in some way after every use and reassemble it before every use, or you will need to be looking for camera drones within the sizing parameters of the storage space available to you. Think about these specifications before you begin. You do not want to end up with a drone too big to store. Otherwise you will basically be adding a new piece of furniture to your home. -Travel: Planning on traveling with your camera drone? A drone with a camera can be a fantastic way to document a road trip, vacation, or destination wedding. However, the bigger the drone, the harder it will be to pack up and take with you, especially if your destination requires flying on a conventional airplane. Many drones have cases available for purchase online and elsewhere. Here’s one industry leading company’s website for drone cases in case you’d like to get an early look, or, if travelling is important to you, consider doing your search in reverse and picking a size range for cases first and later narrowing down which camera drones will fit in that sized drone case. If your drone is truly massive, the case will be too. Therefore, if you plan to travel a lot, or even at all, with your camera drone, looking at models that come in smaller sizes would be a good idea to maintain convenience, ease, and peace of mind. -Battery Life: Will you be using your camera drone to film or fly in remote locations? How long will you need it to stay in the air before coming back down? Can you afford several sets of batteries for your drone? If not, how often will you be able to wait for its batteries to recharge? All of these questions and more are vital to the decision you are about to make for which drone with a camera is the best choice for your specific criteria. Smaller drones are lighter, so their battery can sometimes last longer. However, smaller drones also have less of a weight capacity, so their batteries will be smaller, and therefore they may burn out sooner. Larger drones can carry heavier weighted batteries, and therefore can sometimes last longer too. However, the larger the drone, the heavier the drone, which means the motor will have to use more energy getting the machine off the ground and keeping it in the air, causing the batteries to sometimes burn out quickly. This can be a confusing road to navigate. So which style is better for you? One way to combat this endless debate is to focus on the batteries used in each drone. Higher quality LiPo batteries combined with lightweight materials will often mean the best battery efficiency. In more cases than not, this almost directly correlates to the price range in which you are able or willing to buy your camera drone. An average camera drone will be able to fly for about ten minutes at a time, while a more advanced and higher end drone should be able to stay afloat, with all its features in use, for around twenty minutes. There are some camera drones that can fly without interruption or recharging for 45 minutes at a time or longer! Keep an eye out for these types of drones if your work or hobby will require your drone to stay in the air continuously for long periods of time. -Weight Carrying Capability: If you plan on modifying your camera drone at all, such as by switching out the camera for a more appropriate one for your field of work or play, then pay special attention to each drone’s ability to carry weight. Some camera drones are built to withstand only the total weight of the drone and the originally attached camera. This means that if you were to remove the attached camera, in order to replace it with another, you would have to ensure that the weight of the replacement camera was either precisely at or below the weight of the original camera. Keep in mind that many camera drones will not operate properly if the original camera is removed, replaced, or tampered with, so leave this up to someone who is more experienced if you are not. The weight of any modifications will affect the drone’s ability to do anything and everything, right down to its ability to lift off of the ground and fly, as well as the way in which you can control your camera to film or take pictures. So, if you do plan on modifying any part of the drone at all, you had better be careful to make sure that the drone will still be able to operate at full capacity after the changes have been made. Otherwise, a fun and quirky project could very well turn into the demise of your beloved, and often quite expensive, camera drone. -Agility in Flight: The size of a flying object directly relates to its ability to move in a flexible and adaptable motion through the sky. This is just as true for small, hand controlled camera drones as it is for much bigger faster and stronger fighter jets, commercial airliners, and military UAVs. If you compare a commercial airliner to a fighter jet, you will notice the immense difference in mass, shape, and maneuverability before you notice just about anything else at all. Remember to consider what you want to be capable of when choosing your drone size. Everything comes down to weight, width, height, and agility. This can feel like a lot to consider, but based on the prices of some drones, you should see it as a good investment of time spent to avoid a bad investment of money spent, and sometimes it can be quite a bit of money on the line! -Micro Drones: Micro drones are just that, micro. They are usually smaller than the palm of your hand and are so lightweight that if you take them outside you risk having them fly away with a quick gust of wind. I have yet to see a micro drone with a camera attached, but I mention them here just to provide some perspective for the other upcoming sizes of camera drones we will be looking at. -Mini Drones: Miniature drones are not always camera drones either, but they certainly can be. Mini drones are generally made for beginners who want to experience the feeling of owning and flying a drone, without the financial commitment of their immensely higher priced counterparts. These drones are generally most often not used for commercial needs, but instead are predominantly used for fun for beginner drone enthusiasts. Mini drones make a great gift for anyone looking to get into drones as a hobby. Some mini drones are camera equipped. 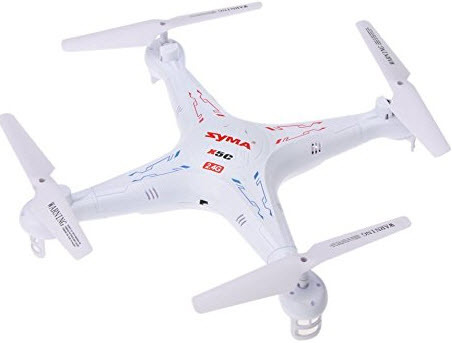 These drones are not to be confused with toy drones because, although they are small in size, they are not small in camera features or flight capabilities. They are made to be compact, portable, and fully functional. Mini camera drones can be as small as the size of your hand and still maintain full functionality. These smaller camera drones are perfect for the novice flyer, as their small size makes them easier to control and safer to occasionally crash. Quadcopters of this size are generally a cheaper alternative to their bigger counterparts, so crashing and damaging them means a lower cost for repairs or replacement parts. Most mini drones are small enough to fly indoors and can perform certain tricks and tasks that other drones simply can not. Picture the difference between flying a commercial airliner in a loop verses doing the same loop with a fighter jet, and you will understand the difference between doing a trick with a big camera drone verses doing the same trick with a mini camera drone. If you plan to do any wild maneuvers with your camera drone, pick a mini drone with a camera that meets your standards for picture or video capturing ability. -Mid/Medium Sized Drones: These camera drones are a few sizes larger than the mini drones we just discussed. Sometimes referred to as “hobby” drones, mid sized drones with a camera are usually about two to three times the size of their mini drone counterparts. Mid or medium sized drones with a camera are mainly used at the semi-professional level, and are the perfect quadcopters for the ameteur aerial photographer or videographer. They are generally made out of stronger material, giving their frames a better chance of surviving the impact of a crash. Their batteries are usually large enough to keep the quadcopter high in the air for more than twenty minutes at a time. These are some of the most commonly purchased camera drones. Some of these drones, like the Syma X5SW, are able to stream live videos to a phone real time! Features like this are important to look out for, because if you need to see what’s coming while flying through narrow lanes or around dangerous obstacles, it will be necessary to be able to have a point of view reference to fly off of. You need to think long and hard about what you will need to accomplish with your drone with a camera before you make a purchase. However, some mid or medium size drones can be acquired for as little as fifty dollars! With proper video equipment and unrestrained flying capability, a mid size drone with a camera in this price range is truly a steal of a deal. -Large Drones: Our final size category, large drones with a camera are much greater in size and power. Generally bought and used at the commercial level, these drones and quadcopters are perfect for industrial or professional work. They can and have been used for professional filmmaking, photography, search and rescue missions, and military operations. Acquiring a drone of this size and potentiality can be an expensive endeavor. However, if you are planning on using your new drone with a camera for professional or semi professional work, getting a large camera drone might be your best option. Large drones generally have the best cameras with the best capability and functionality. Most will come equipped with HD 4K photo and video cameras attached right from the start. This means that capturing the perfect shot of that epic landscape or fast moving action scene will be practical and somewhat easy to achieve. Modification is also an option with large camera drones, however, with such awesome capability right from the start, there is almost no point in pursuing this option for most camera drone purposes, even in the professional filmmaking realm. The equipped cameras in this category of camera drones allow for top of the line, high definition recording at fast speeds. With little to no wind interference due to heavy arms and widespread wingspans, these pictures and videos should come out looking perfect at best and professional at least. Don’t expect to be able to fly a large camera drone perfectly if you have never flown a drone before, though, as they can be bulky, heavy, and unforgiving to even the occasional crash. So new buyers should steer clear of this category, unless they are willing to make a large and rather risky investment in something they may not be able to control properly. -Resolution and FPS: Clearly, the type of camera included with your new unmanned aerial vehicle is going to be of paramount importance, depending on how serious your particular line of work or hobby is. A great drone with a weak camera can make some beautiful aerial shots look like pixelated mosaics. This is why I took special care in going through many different camera drone options and researching their camera specifications, with resolution and FPS being the most forefront. Most modern drones with a camera offer both still photo and video capability. That is why I chose to review FPS, or Frames Per Second, over mp, or megapixels. A word of warning, however, I did come across several camera drones where the fps and mp ratio was disproportionate, meaning either the camera had great film speed but poor still photo prowess, or vice versa. So, when searching for your ideal drone with a camera, be sure that the camera meets all of your needs or wants, and not just some of them. That being said, the results I came up with are fairly simple to follow. If a drone with a camera is being sold today at a high end price with a camera resolution under 1080p, do not buy it under any circumstances. The same goes for any camera with a speed of 30 fps or slower. Here is my very clear reasoning behind this statement - almost every camera attached to a drone in today’s market is a 4K Ultra High Definition camera with higher and higher speeds becoming available every day. We are living in a time when high priced yet affordable electronics such as camera drones are sold in a buyer’s market, meaning that companies selling these products are so abundant that they must constantly compete with each other by lowering prices and adding features. This is great news for you! It means that you can expect - and even demand - from your UAV producing organizations a top of the line product with top of the line features for lower and lower prices each year. The quality of the camera for your drone is no different. Accept only the very best for your professional or hobbyist needs. They should be as important to your drone’s producer as they are to you. What is a Gimbal, and What Does It Do? In the end, we recommend considering the whole package. Evaluate each model carefully so that you understand what makes it different from the alternatives. Or just subscribe to our review blogs or like us on facebook, to stay current with the latest in drone news and developments. -Definition: As defined by the Merriam-Webster online dictionary, a gimbal is “a device that permits a body to incline freely in any direction or suspends it so that it will remain level when its support is tipped.” That’s quite a mouthful, isn’t it? Let’s explore that a little bit further to get a better understanding of exactly what a gimbal is, and how it’s used in camera drones. Put as plainly as possible, a gimbal is a support system for an object. It provides absorption around the object to allow the object to remain parallel with the ground at all times, regardless of any motion happening around the object. To provide some background, gimbals were originally support systems that were widely used on ships, to keep things such as navigation instruments, other equipment, and even things as simple as drink holders, balanced horizontally while the ship rocked back and forth in the rough seas. In the same sense, the gimbals used within drones are meant to keep the camera from experiencing all the movement of the drone itself. But unlike the gimbals of days of old, these modern gimbals often operate using remote controlled and highly calibrated electric motors. The good news is you don’t have to understand everything about how a gimbal works in order to utilize it. You will have to understand a few main points though, in order to be sure you pick out the right camera drone that comes with a gimbal in place, or the right gimbal to add to your camera drone. I’ve covered those main points below, starting with the number of axes a gimbal has. Simply put, to yaw is to twist. Two axis drone camera gimbals do not compensate for yaw. This means that, while they will allow your drone’s camera to stay steady through any up and down or left and right motions, they will not steady the camera against twisting left or twisting right. You might assume that this would only matter if you were to physically twist the drone via its remote control. However, keep in mind that your drone will be flying freely through open air, meaning that it could easily be twisted left or right autonomously, by a strong gust of wind. For this reason, when choosing a drone with a camera or when choosing a gimbal to add to your drone, selecting a three axis gimbal is the ideal choice. Of course, that choice for 3axis gimbals will come at a bit of an added price when compared to its two axis counterparts. Three axis gimbals will also be slightly heavier than two axis gimbals, so bear that in mind, especially if you are looking to add a gimbal to a camera drone that doesn’t come with one already. It gets even better with 6axis gyro systems. Remember, using a gimbal in the first place is almost always superior to not using one at all, so buy within your price range and your results should still improve. -Control In Flight: A gimbal which comes with or is designed for a specific drone with a camera will be beneficial if you plan on being able to control the uninterrupted tilt of your camera while in flight. When a gimbal is a standalone or generic version made to be very universal, it likely won’t have the ability to be patched into your remote control to allow you access to move the camera while in flight. There may possibly be a smartphone application or similar software for changing a particular gimbal’s movement and angle, however utilizing such software while your UAV is in flight might prove difficult. For this reason, it is smart to consider purchasing only camera drones with gimbals attached or gimbals meant for your particular camera drone’s brand and possibly model. This will ensure that your gimbal is fully compatible with your drone, leaving nothing up to chance. -Camera Compatibility: If you do decide to purchase a universal or outside gimbal, it is extremely important that you make sure to check and see if the gimbal you are purchasing even supports your drone’s camera in the first place. By “support,” I am referring to the gimbal’s ability to hold and control your camera’s size, weight, and other parameters. If you fail to check for this compatibility, you will be sure to be sore at your mistake, as your brand new gimbal will be useless with your brand new camera and drone. -Calibration: Although calibrating a gimbal isn’t necessarily very difficult, it can certainly be tedious. A gimbal which is designed for a particular brand or model of drone should almost always come pre-calibrated. This plug and play version of the gimbal experience will make getting things out of the box and off the ground that much easier for you, especially if you are a beginner. Consider pre-calibration as an important aspect if you are buying a gimbal to add to your camera drone but are apprehensive to performing the calibration yourself. For that reason, or if you’re just in a rush to get started, look for a pre-calibrated gimbal when purchasing a separate gimbal to add to your camera drone. -Get Acquainted: Unboxing your new drone with a camera will be an experience stacked with excitement. Next will come the overwhelming nervousness of thinking to yourself, “What if I crash it? !” Do not be alarmed. A quick and simple overview and reading through of your owner’s manual or flight guide should help you to calm some of your nerves. Remember that the more you know and understand about your new camera drone, the better off you will be if an emergency situation should arise while the drone is in mid air. Be sure to learn as much as you can about what each particular button on your remote means, what each part of the drone does, and what you can do to avoid mishaps. Watch videos online of your particular drone so you can see which mistakes other people have made before you, and then learn how to avoid making the same mistakes yourself. Once you start to feel a bit more confident in your knowledge, it’s time for a test flight. Find a nice safe and open area nearby where you can go to practice flying your new camera drone. The more air space, the better off you will be to start. Start with simply getting your UAV to lift off of the ground, then gently allow it to land. Repeat this until you feel comfortable with these basic maneuvers before you move on to more advanced ones. Once you feel like you are in control of your drone, start to push yourself. Little by little, each move will become easier and easier, and before you know it, flying your new drone won’t even feel the least bit daunting! Now that you’re comfortable flying your drone, it’s time to start considering some drone photography tricks! Drone photography, much like regular photography, has an endless number of options and styles for you to consider and choose from. Below are just a few that I’ve picked out for you to take a look at. There are thousands more in a long line of articles, videos, and how-to’s online. Simply search “drone photography tips,” “aerial photography tricks,” or any variation of these phrases, and you will be amazed at what you come up with! -Strike a Pose: Utilizing your new drone’s aerial perspective can bring you a whole new dimension of photography… literally! Using the camera facing downward, if you or a group of your friends lay down flat on the ground, you can create illusions such as jumping from one object to another in ways that would normally be totally impossible in the laws of physics. This trick can also be used to make stop motion animation of many sorts, easily making a real person look just like something out of an old video game or cartoon. -Get Symmetrical (Not Technical): Although we often don’t realize it from the ground level, many architects use symmetry in their buildings, roofing, or landscaping. Also sometimes hard to see is that much of nature is almost perfectly symmetrical in complexion, especially with the bird’s eye view your brand new drone with a camera will provide you. Keep an eye out for all things symmetrical, as they can often offer some of the most supreme backdrops or direct images available out there from the sky. -Aerial Angles: It may be hard to do at first, but try to always keep in mind that your drone is not limited by the same set of physics laws that you or I am. This means not only flying, but also flipping, tilting, reversing, shimmying, and just about any other movement you can think of, is entirely possible with your new camera drone in your corner. Visualize being able to whip rapidly around the corner of a skyscraper many stories off the ground, then nose-dive toward the ground and stop directly above your subject, who is nonchalantly walking down the sidewalk as if this incredible feat did not just happen right above their head! These things are actually possible today with the right types of camera drones. It no longer requires expensive computer editing software to accomplish such feats. With that in mind, use the following tip to take next level aerial photos and videos. Utilize different angles, directions, and movements to create contrasting imagery. Either combine or choose from these separate images to create superior work to the most simple and direct first choice. For instance, as a very basic example, if you were initially flying on the left side of your subject, try flying on the right side for the next shot. In aerial photography, this can change things drastically. The sun could be nowhere in one shot and directly behind your subject in the next. Buildings, nature, or whatever else is surrounding your subject, will often be completely different on one side or the other. This creates contrast in your options for when you are going through and editing later. Use this tip for a diversified portfolio as well. -Cool Contrasting Colors: One of the most visually impactful things you can do with a camera drone is see ordinary things from a new angle. This allows for some very interesting color contrast. Take, for example, incoming waves on a beach. Look out from the shore and you will see the sand in front of you, the foam of the waves crashing, and the horizon far off in the distant background. But zoom out to the angle of a drone with a camera, and you will see the dark deep water, directly followed by a sharp contrasting white from the foam, next to a line of tan or white colored sand on the shoreline. This sharp contrast is what I’m referring to. The dark blues of deep ocean water have a deep distinction from their white foam predecessor, which has a stark polarity to the brown tinted sand next to it. Color contrasts in photography and videography have commonly been used to create stunning imagery that almost immediately envolks all kinds of emotion from its viewers. You can elicit the same response from your viewers and fans by finding places nearby or far away that have this type of cool color contrasts. For a landlocked alternative, try something like cornfields that run right up against a forest line. After all, with a drone with a camera, the sky’s the limit! -Night and Day: The time of day in which you use your drone with a camera should vary for varying results. Otherwise, if all your pictures or video are captured at noon, for instance, all your results will include subjects without shadows. Then again, maybe that’s a trend you are looking to adhere to. In this case, more power to you! However, if you feel that your repertoire requires more variety, try capturing images, even the same image, at different times of day. Try capturing that same image at night. Which works best? Dawn? Dusk? Midnight? When you try several different times and angles, you begin to narrow in on a particular style that suits you. That style becomes your essence to follow, which can eventually become the symbolism you are recognized for. Q: How much are drones with cameras? A: Drones can cost anywhere from less than one hundred dollars to well into the thousands. This is all dependant on features, materials used to build the drone, weight it can carry, and other similar factors. Q: How do drones with cameras work? A: UAVs or Unmanned Aerial Vehicles, also known as drones, consist of two parts. The first part is the drone itself, generally a flying machine composed of lightweight composite materials, both for maneuverability and strength. The second part is the remote controlling device, sometimes called a ground cockpit. A drone with a camera will have remote controls for both flying the drone itself as well as controlling the camera connected to the drone. Q: What camera drone to buy? A: With so many different features available on different types of camera drones, the choices are endless! It can be tough to make this choice, especially when there is a good portion of money at stake. Compile a list of features you would like on your particular drone, determine a price range you’re willing or able to purchase in, and begin the search for your incredible flying machine! Q: Where to buy drones with cameras? A: There are many different outlets for purchasing drones with cameras. Your local electronics store may have specific versions of aircraft available. Generally, though, the best place to look for drones, pricing, and features, is online. Looking and buying online allows you to see all options and modifications available, and explore pricing and reviews, all from the comfort of your own home! Q: Which camera drone is the best? A: This question will again depend on your particular needs and desires. When searching for your perfect drone, be sure that it has all or most of the features you want or need before making your final pick and purchasing. Q: What are drones with cameras used for? A: Most camera drones are used for what is known as drone photography. This is a new and exciting version of aerial photography which can be utilized in many different aspects of daily and not so daily life. Drones are now used to collect still and moving imagery of everything from weddings and real estate to storms and cliffsides. With the right drone in the hands of the right person, the possibilities truly are endless! These drones are being used in a number of professions and hobbies including photography, videography, filmmaking, search and rescue assignments, some military operations such as their recent use in recon missions, and, believe it or not, there are even such abstract uses of camera drones as fishing! It is hard to imagine what these flying machines will be used for in the near and distant future, because as ideas come to life, so do new opportunities for drones with a camera to assist us in our everyday lives. Remember to check out your countries drone laws before flying.